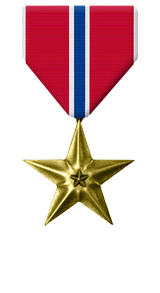 For meritorious service in connection with combat operations against the enemy while serving as the Commanding Officer, Kilo Company, Task Force Military Police, 3d Battalion, 3d Marines, II Marine Expeditionary Force (Forward), from 10 April 2009 to 1 October 2009, in support of Operation IRAQI FREEDOM. Captain Torres led his company in convoy security, enemy combatant detainee release, and personnel recovery missions in Al Anbar Province, Republic of Iraq. Under Captain Torres’ Command, Kilo Company conducted 64 combat security missions covering over 17,000 miles. His leadership was instrumental in establishing Kilo Company as the battalion’s main effort throughout the seven month deployment. Captain Torres’ company flawlessly conducted fifteen mass detainee releases; sensitive missions with possible strategic implications. Most notably, Captain Torres commanded Task Force Personnel Recovery during July of 2009. His forward thinking and creativity was an integral part of the Task Force’s success. Captain Torres and his Marines and Sailors dedicated themselves to creating heretofore undefined techniques and procedures finally recovering Captain Scott Speicher of the United States Navy, the first casualty of the Persian Gulf War. Captain Torres’ tenacious commitment to mission accomplishment and inspiring personal example kept his Task Force on the recovery site days after the projected end of mission date relentlessly searching under the most austere conditions. His accomplishments closed a nineteen year investigation by the Department of Defense. Captain Torres’ total effectiveness, forceful leadership, and loyal devotion to duty reflected great credit upon himself and were in keeping with the highest traditions of the Marine Corps and the United States Naval Service.